Bearings, Bushings, Idlers and Balls - Nordex , Inc.
Nordex has a large inventory of Miniature Precision Ball Bearings available in Metric and Inch Sizes. 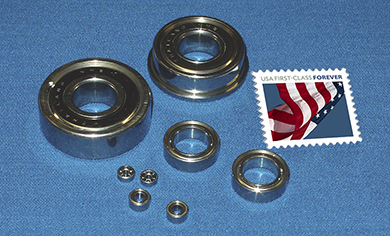 400 Series stainless steel and chrome steel bearings are available in ABEC 1, 3, 5 and 7. Nordex has a class 100 clean room. With this relubrication facility on our premises we can assist you in the selection of the proper lubrication for your application. available from stock – please see Section A in the Nordex Design Guide. Purchase directly at the Nordex’ E-Commerce website. Support Rails can also be found in section A of the Nordex Design Guide and may be purchased directly from the Nordex’ E-Commerce website. Nordex Precision Linear Bearing is a linear motion mechanism utilizing the rotational motion of ball elements. Since linear motion is obtained using a simple mechanism, the linear bearings can be used in a wide variety of applications, including transportation equipment, food processing equipment, and semiconductor equipment. Nordex now offers a new standard in linear motion. Our “High Performance” precision Linear Bearing has three times the load capacity, capable of providing up to 27 times normal travel life of a conventional linear bearing.